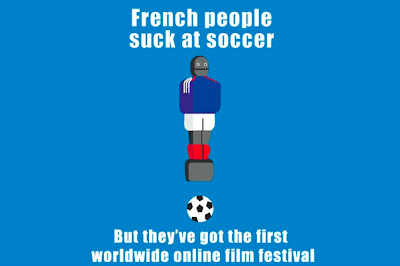 This year, The French Film Festival is rolling out one of the funniest campaigns via new media. With the support of UniFrance and AlloCine, the French Film Association will be screening the most recently released films in France submitted by the rising stars in the French film industry. The online event: My French Film Festival starts today and goes on till January 29. The selection includes 10 films and 10 shorts--available for online purchase and viewing in its full festival entirety for just $18.40, by film for only $2.60, and by short for a mere $1.30. The panel of judges will not be including a team of snobby intimidating artists, rather the judging is left for the public, critics and bloggers alike. The winners will be announced post festival. Although, Mon Festival de Film Francais claims to be the first to offer online global viewing (pictured above), the Tribeca Film Festival beat them to the virtual punch this past spring when they launched their screenings on the web, as well as TV On Demand, and what else: they even had an app for that (see HERE). Video after the jump. Nevertheless, have a look at this super funny trailer (below) --self-deprecating style, and you might just find yourself dying of laughter. Smelly cheese anyone? For the complete listing and purchase of French films online, go HERE.